As a fence ages and gets battered day after day by harsh sunlight, dirt and heavy rain or snowfall, it loses its original finish and starts to turn an unattractive blend of shades of grey. Fortunately, you can bring back that old fence's luster by refinishing it. If you want to refinish a fence like this, however, you do need to pressure wash it first. Freshen up that old fence by pressure washing. When you go to rent or buy your power washer, remember that you're only washing the surface of your wood fence, not trying to scour years of filth off of concrete. You only need a pressure washer that operates between 1,500 psi and 2,000 psi. Use anything higher than that and you risk splintering the wood and ending up with a pile of kindling instead of a freshly washed fence. A 1,500 to 2,000 psi pressure washer is powerful enough to remove dirt, grime and the thinnest, oldest top layer of aged wood, leaving behind a clean surface for you to stain without damaging the core structure of the wood. With the right tool for the job in hand, you'll be able to make quick work of that tired, greying fence. A 25-degree tip is ideal for washing a fence, particularly if you're unfamiliar with pressure washers. 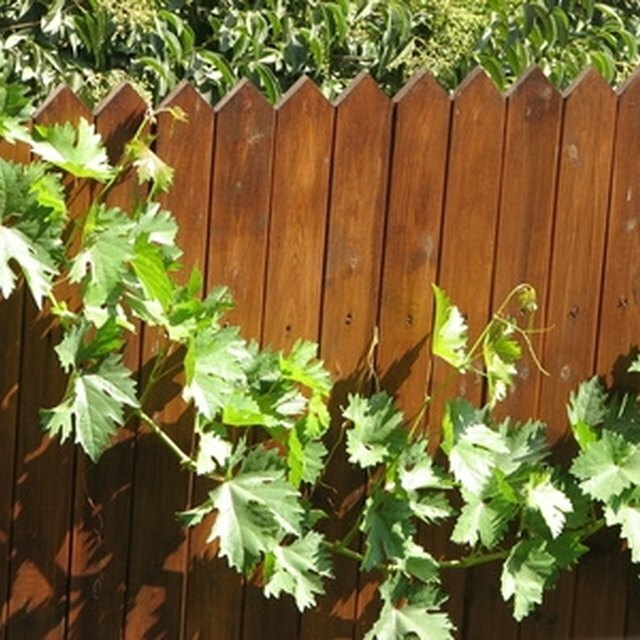 Once you get the hang of it, you can use a 15-degree tip, which washes a bit more aggressively and may be better suited for older fences with a lot of grimy buildup. Not only does this wash away the grime, but pressure washing prepares the wood for the stain by opening up and cleaning out the pores of the wood. You must wait until the wood is completely dry before attempting to stain your fence. When picking a stain, look for products that have "waterproof" and "exterior" on the label -- these products will stand up to changing weather conditions to keep your fence protected. Work in small sections and use a roller or sprayer to apply the stain, then brush the stain into the wood with a wide paintbrush. This technique is called backbrushing and it allows you to spread the stain in an even coat after rolling or spraying. This also spreads the stain into any grooves, gaps or other difficult-to-reach areas. When you are satisfied with the color of your fence, apply a protective topcoat to help weatherproof the wood. Look for products that are designed for exterior wood surfaces -- this information will be right on the front of the packaging. Polyurethane is a popular choice because it is fairly durable and comes in different finishes: matte, satin and glossy. If you choose polyurethane, note that you must lightly sand with fine-grade sandpaper between each coat. No matter which type of protective topcoat you decide to use, read all manufacturer's instructions before you use it, as this information varies from product to product. What Kind of Primer to Use for Wooden Decks for Stain?